From time to time we like to focus in on one of our custom floor plans to give you some more detail and insight into a look or style you may not have otherwise considered. When it comes to ranch vs. multi-story, most folks are usually firmly in one camp. But that may be because they’ve never really considered the advantages of the alternative floor plan! 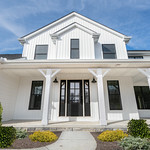 So today, we’re introducing you to one of our more popular ranch-style homes, the Bristol, which now features two brand new elevation styles: Craftsman and Farmhouse. Read on to discover why this ranch-style home could be the perfect floor plan for you! 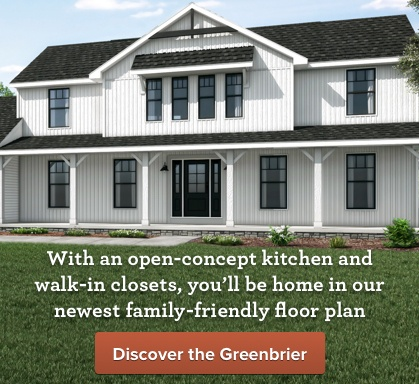 The Bristol is a charming three-bedroom, two-bathroom home with 1,357 square feet of living space. That may sound small at first blush, but it’s how you use the space that matters, and the Bristol uses it brilliantly. All the benefits of main, single-floor living are apparent in this perfectly sized ranch. It’s a smart, efficient floor plan that boasts not just a generous family room, but also a dedicated dining room space and a comfortable kitchen. You may be wondering what sort of storage options are available in the Bristol, and that’s a good question because every family needs storage — and that’s often a reason folks move in the first place! Inside the Bristol, you’ll find a huge pantry in the kitchen for all your cooking needs, a beautiful walk-in closet in the master suite to store all your clothes, shoes, and other wares and both your cars will fit in the two-car garage, along with whatever toys and equipment you need to be sheltered from the elements. One thing you won’t find in the Bristol? A staircase. Everything is located on the main floor, which makes cleaning, organizing, and general living much easier — forget hauling laundry up and down a flight or two of stairs, unplugging your vacuum and lugging it upstairs, and more. It’s also more convenient for empty nesters, who might find stairs difficult as they grow older, or for newer families with young children. The Bristol is now available in four refreshed elevations or exterior styles; Classic, Tradition, Craftsman and Farmhouse; so you can choose the look that’s perfect for you. Still wondering if this might be a good fit for your family? 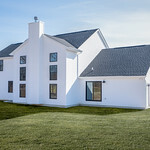 Check out our Flickr album of this home and dig even more into the details! Ready to talk about the Bristol? What about any of our other custom floor plans? We’re here for you! Give us a call today. 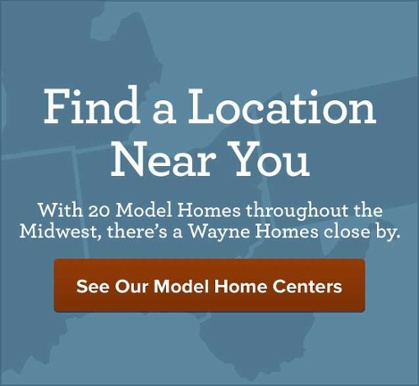 Wayne Homes is a custom homebuilder in Ohio, Pennsylvania, Indiana, Michigan, and West Virginia (see all Model Home Centers). We offer nearly 50 fully customizable floor plans and a team dedicated to providing the best experience in the home building industry. For more information, Ask Julie by Live Chat or call us at (866) 253-6807.